For the live-action Patlabor movies, they made a giant Patlabor mecha. It might look like just some promotional prop, but they built it tough. How tough? Strong enough to weather a typhoon. This weekend, much of Western Japan was hit hardest by the typhoon, Osaka included. 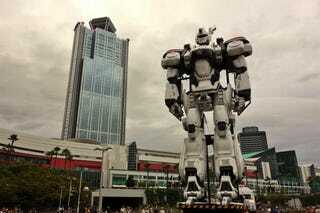 The life-sized AV-98 Ingram from the anime, manga, and now, live-action versions of Patlabor was on display in the Osaka Bay Area. Here you can see the Patlabor on August 9, when the typhoon was just starting to hit. Things got worse on Sunday, August 10, and the city was battered by more wind and rain. This typhoon caused flooding, landslides and left at least ten dead in its wake. This was serious stuff. Twitter users, like Hietaro, were at the Patlabor event on Sunday, documenting the situation as workers moved the mecha, in its reclined position, to a slightly more secure location in the harbor. Some of these photos were taken outside, but as the typhoon got more severe, Hietaro had to move inside. [Photo: Hietaro] At this point, the building's doors were apparently locked. By late afternoon, the worst of the typhoon had passed, and the Ingram event proceeded. Twitter user Suizou was on hand to capture the festivities. Not only did the giant mecha still function as it should, this was the last night the Ingram was to be displayed in Osaka. Thankfully, the typhoon passed in time. You can follow Hietaro here and Suizou here.